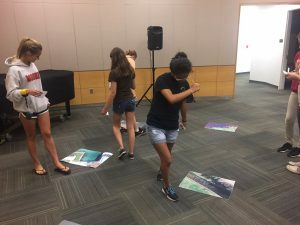 May’s Teen Science Café was about using photo ID for researching manatees. 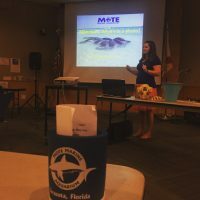 While enjoying pizza, drinks, and time with our friends, we listened as Sheri Barton and Jennifer Johnson explained how and why they use photo ID on manatees. We learned about manatee’s habitats, eating habits, behavior, how they care for their calves, and how they die. We saw many photos of local manatees and got to hear about their personalities and where they are living. Sheri and Jennifer also explained to us how they use aerial photos to count how many manatees are in a particular area. Teens looking at aerial photos of manatees. 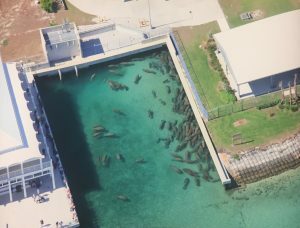 Aerial photo of manatees used in activity. After the presentation, there were two activities. The first was a matching game between real photos of manatees and drawings of the same manatees. The second was a game where we had to circle around aerial photos of manatees, much like the manatee researchers do, and count how many manatees we saw. This game was quite a challenge! There was also a table with some replicas of manatee bones, the types of sea-grasses they eat, and the types of tracking tags that are placed on manatees. I enjoyed this café very much and really learned a lot about manatees!